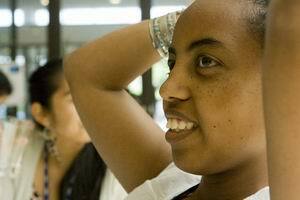 Alemtsehay is from the YWCA of Ethiopia and she is the 2011 one year inter and Programme Associate in Communications. She shares with us her dreams and how she got to where she is today. I was invited to speak on my journey in the YWCA movement at the World YWCA Council and to share my values as a young woman. Here is what I shared with my sisters. I was first informed of the activities of YWCA Ethiopia from a meeting with one of the board members. I then looked for more information and found out that it is an Association with a strong commitment and proven-record of improving the quality of life of poor and vulnerable segments of communities, especially women. I was a graduate International Relations student at Addis Ababa University when I first visited the office of the YWCA of Ethiopia. I felt compelled to volunteer and be part of this blessed and noble mission, and I started to think about the ways in which I can be useful to the Association. I began to work as a volunteer for the public relations committee in 2007 and later in 2009, I joined the YWCA of Ethiopia as a staff member. I have been involved in different tasks since I was hired by the Association. My experience at the YWCA taught me to chase my dream, to find my real passion and to work hard. I have always believed that change comes from individuals, including me. I was strongly convinced that the internship position at the YWCA office in Geneva would give me a clearer insight, knowledge and exposure to the skills and knowledgebase available there. The skills I‘m getting and the exposure will certainly be of great use for the work I do at the YWCA Ethiopia. I asked myself why was I applying, and I to myself I answered: “Because I want to learn, it is part of my big dream, I have a true passion for the YWCA movement. I received enormous support from people around me – a lot of empowerment, prayers, love and recommendation. Now here I am. Excited, learning and challenging myself. What I know now is to dream, dream, dream and take action. Follow your passion and deliver from your heart. That is what I am learning and I am a witness that dreams that appear to be impossible to reach can actually come true. Continue to dream and to take action, Alemtsehay. You are a model of what can grow out of such dreams. Thank you for all you are doing as a leader within the YWCA movement.